Snoop Dogg to take over Bollywood! Snoop Dogg and Akshay Kumar from Singh is Kinng. With those words, one of America's most successful -- and controversial -- rappers has announced his arrival to the sub-continent. Calvin Broadus Jr, known to the world as Snoop Dogg, makes his Indian debut this summer, with a guest appearance on the title track of the highly anticipated Singh Is Kinng [Images]. Also Read: Creating history with Snoop Dogg! If you're in one of India's major metros, chances are you've already heard the song, with its bumping bass line and repetitive chorus, Singh is King, Singh is King, Singh is King. And though it contains bhangra elements, the song is undeniably hip-hop. Snoop raps about topics close to heart: expensive cars, beautiful women and flashy jewellery. But the ease with which layers of Punjabi beats and lyrics are infused into the track demonstrates how closely Indian music and hip-hop are related. 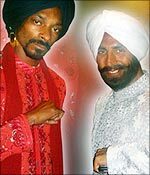 Unfortunately, Snoop wasn't able to make the long trip to India for the video shoot, which features Snoop Dogg wearing a turban and a sherwani. But Akshay Kumar [Images], who's starring in the film, was able to travel for Chicago for the video shoot, and stars with Snoop on both the track and in the video. It's rumoured that the two got along fabulously on-set, with each teaching the other a little about his culture. Akshay learned about America's hip hop culture, while Snoop picked up a few bhangra steps. Sadly, the lovely Katrina Kaif [Images], who co-stars with Akshay in the film, doesn't appear in the music video. But Katrina, a self-admitted fan of hip hop, says she expects the song to be a hit. "It's a superb track, in my opinion. It has the potential to become an anthem. I love it; I think it's great," she told rediff. And while it's known that the song will get heavy rotation in India, according to the New York Times, Geffen Records, which owns the distribution rights to the song in the United States and Canada [Images], may release it in North America later this year as part of a compilation. The next step? Snoop claims to be 'coming to take over Bollywood' saying he's 'never been able' to come to India. 'This is just the beginning,' he adds. And though the music may share elements, they've in the past been rather separated. For instance, few hip hop fans would be able to name the first thing about Indian music. And bhangra fans in Punjab would be hard pressed to name even a couple hip hop artists, though these musicians often sample bhangra beats for their songs. But that wall of separation is beginning to show cracks. With the recent visits of Akon and 50 Cent to India and the increased visibility of Bollywood in the West, the two cultures are learning more and more about one another. And apparently, people like what they're hearing.